Logging and mining pose obvious threats to wildlife habitat, but their impact on ape populations is not fully understood. The socioecology of great apes contributes to their vulnerability: they reproduce slowly, are sensitive to human intrusion, and nest and forage in trees. But some species and some environments are more sensitive than others, and some industrial practices more or less disruptive. At the extreme, clear-cutting forest for timber or agriculture and large-scale open-pit mining are incompatible with survival. 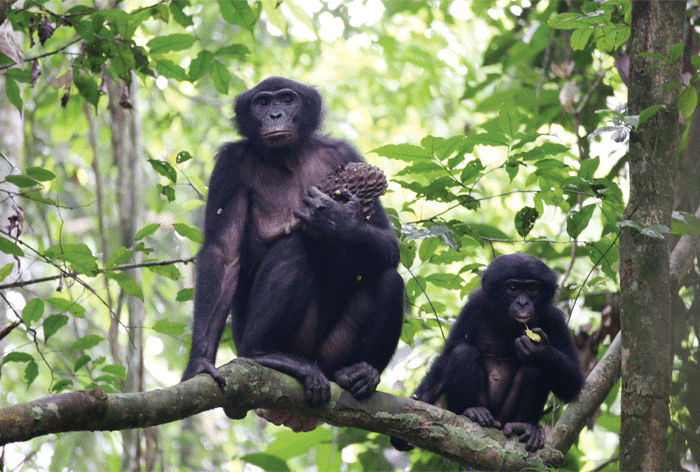 Evidence suggests that reduced-impact logging in sustainably managed forest is compatible with ape populations, especially if there are adjacent natural areas to serve as refuges. In general, any industrial activity carries with it significant indirect impact: for example, cutting roads through forests destroys the continuous canopy that great apes prefer and gibbons require and makes remote areas accessible for settlement and hunting. Noise from machinery creates stress and can interfere with communication among apes. Displaced populations may be forced into contact—and conflict—with other animals. In the long term, ape survival will depend on management strategies that recognize the specific needs of each species (for shelter, food, and social space), minimize the impact of industrial processes, and allow time for habitat regeneration after the conclusion of a project.